The Ideal Seam Guide sticks to your sewing table and machine to help sew a consistent seam. you can sew the perfect 1/4" seam for all of your quilting projects. 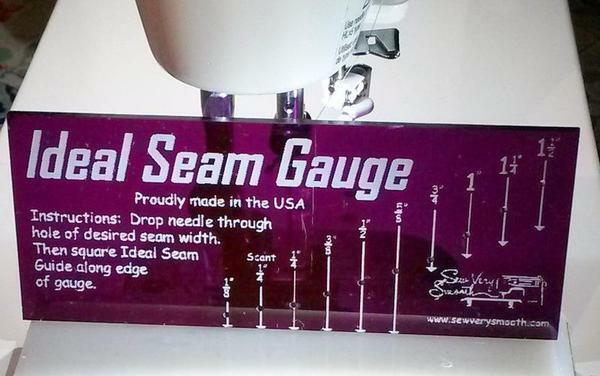 The Amazing Ideal Seam Gauge! Set your seam allowance accurately and consistently with ease! Simply drop the machine needle into the desired seam width hole and square up your Ideal Seam Guide. This may well become one of the most valuable sewing tools you possess. Important Legal Stuff: All trademarks, service marks, images, trade dress, product designs, and unique marketing and/or promotional materials are owned and controlled by Sew Very Smooth. Use or reproduction of these properties without the prior written consent of Sew Very Smooth may constitute intellectual property infringement and unfair competition in violation of federal and state laws. The Beginners Pack Student Edition begins the same as the Beginners Pack Comb with the addition of the Ideal Seam Guide Curve. 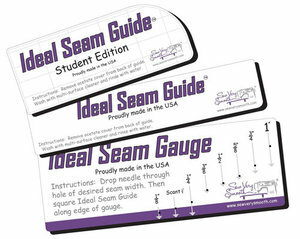 Seam Guide Kit Student Edition- Kit includes: a 4" Ideal Seam Guide, a 4" Ideal Seam Guide with curve, and an Ideal Seam Gauge with needle placement measurements from 1/8" to 1"
A wonderful tool to set accurate and consistent seam widths using the Ideal Seam Guide. Set your seam allowance accurately and consistently with ease! Simply drop the machine needle into any one of the 10 seam width holes and square up your Ideal Seam Guide. Remove the Ideal Seam Gauge and you are ready to sew so straight! This may well become one of the most valuable sewing tools you posses! Excellent measuring tool to set an accurate and consistent seam allowance. for your fabric as you guide it to the needle. You can re-position the Ideal Seam Guide hundreds of times! rinse it and let it air dry. The Ideal Seam guide regains its grip again and again! The Ideal Seam Guide sticks to your sewing table and machine to help sew a consistent seam. It is removable and reusable. Used in combination with Sew Very Smooth's Ideal Seam Gauge, you can sew the perfect 1/4" seam for all of your quilting projects.